“Loud guitars, a shot of whiskey and the middle finger”. That’s on the band’s Bandcamp page and it does a remarkably job of summarizing the band that is ZED. 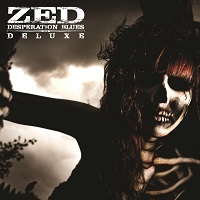 I wasn’t surprised to see that the guys in ZED dig a lot of the bands I dig too. Bands like, MOTHERSHIP, HOLY GROVE and PLAINRIDE. I’m willing to bet, GREAT ELECTRIC QUEST falls into this mutual appreciation group as well, and hot damn, what a night of music those five bands could put together sharing a live bill on any random night. “Desperation Blues” was originally released in 2013, but has been updated here for 2018 (and 2019 I suppose). ZED is a powerful quartet, of that there is no doubt. Think of all those bands usually listed as influential for the broad net that is Stoner/Doom Metal. I’m not going to name them, but surely you know at least a few of them. Those influences are present in the DNA of ZED without question. But there is a uniqueness that strikes ZED apart from the plethora of bands simply wanting to clone or ride the coattails of their heroes. ZED also honors their contemporaries as well. Bands like CLUTCH, RATM and QUEENS OF THE STONEAGE all influence as well, and effectively balance out those dominant name droppers of yester-yore. Sattari and Lopez seemingly out-riff one another at every turn, only making tracks like “Skin & Bones” and the title track, “Desperation Blues” all the more addictive listen after listen. “Crawl Back To You” shakes up the formula just enough to really be a standout, building on a bluesy groove that’s infectious. Sattari’s vocals at times achieve a raspy, gravelly Cornell-like feel, but there’s a different approach on “Crawl…”. It’s cleaner, more distinct, and perhaps even more powerfully rendered. “More” allows Aceves to really showcase some fine and funky bass runs before and in between the dual guitar assault. It’s a subtle addition, but one that really adds a creative uniqueness to it’s surroundings. “Desperation Blues” was followed in 2016 by the fabulous “Trouble In Eden”, but this re-issue shows the good bones were always there. Thunderous drums, steady (and occasionally funky) bass, guitar riffage and soaring vocals. Old meets new. It’s a proven formula, and ZED seem to have a knack for it. This reissue is worth picking up whether to update an earlier copy, or for a new listener. Good job to Ripple Music for deciding to toss it back out there.